His previous book, Lead Well and Prosper was a big hit with me and I’ve used it for training several people in my workplace on good management and leadership behaviors that are easy to implement and measure. This led me to be really excited about McCormick’s new book. So, this book is a look at many of the actions that employees often carry out in the workplace, that really stem from childish behaviors. They are examples of some of the low level thinking that goes on in the workplace not for the best possibility for the organization, but typically for some behavior learned long ago and still carried into the workplace years later. Overall, I think McCormick has a nack for making things in the workplace a lot simpler than many people first realize and he has done this again very well with his outline of a behavior in each chapter. The chapters and content cover the majority of the poor things you might see in a typical office where behavior is something not managed well or where there is truly a lot of dysfunction and little positive teamwork and accountability. I have the joy to say I just don’t have to face many of these in my work and so, ready through them, I really had my doubts if these are typical in business or not, the text certainly says so and I hear it all the time from friends at other work environments. I’ll continue to have that luxury in my work and enjoy the lack of these childish behaviors. For that reason, I lowered my star rating as I personally just didn’t find much value here, and it seems to highlight behavior that I can’t believe is more easily eliminated before getting the level often written about in the book. The cartoons, while amusing add to the childish message and I thought they were over the top, losing some of the credible seriousness a business book should have. So, keeping that in mind, there are certainly a lot of things to learn from if you have a workplace or work environment where people do act childish, there is fighting between people and groups, and where the power plays and politicking resort to childish levels. Excuses and blame games are two of the topics, another is covering up mistakes, as well as taking more than your share. All of these childish things are described in a work context but as the childish act and story. McCormick has 14 short chapters in the book, one per topic and at the end of each, he outlines very clear dos and don’ts, similarly to his last book, which I really like. These do reinforce his points in each chapter and make the book very easy to learn from and actions to take away. 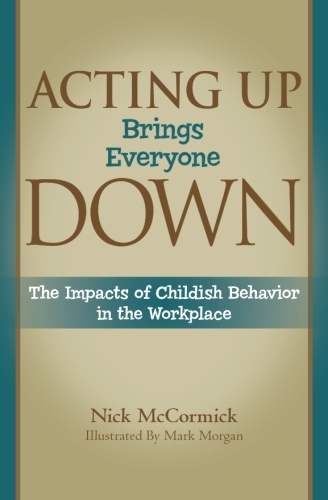 So, its a very short and easy read, and simple to understand so if you face childish behavior in your workplace, then perhaps this book is the perfect guide for you (and maybe for some of the others acting childish as well!). Be professional always while you are at working place.Any childish behavior can exploit your image and after that you feel embarrassing.. Same with me, Mike. At my part-time job, I work with a group of rotating staff and even then, I have never seen any sort of childish behavior or ugly politicking either. Everyone just goes about their business, appreciative of the job they have. Although I have to say, there isn’t a high level of friendliness either but I guess that is a good thing for productivity as everyone is wary of goofing off in front of one another. Thanks Jean, sounds like a great place to work for you then if you don’t see these childish behaviors. I’ve seen a bit of rumor or gossip from time to time, but it is never about other people, usually about the work itself or business decisions, which I think is much healthier. On the other hand, we have many long lasting friendships in our office and many of us do stuff together outside of work as well, so there IS a lot of friendliness around, and as a result, we certainly bring fun into the workplace, as it makes for a boost in productivity itself as people enjoy their work more and can be themselves, including any goofiness. I think it is a function of how well people know each other though when it comes to fun and productivity still existing at a high level. Oh, I remember one of my colleagues with this “Crybaby” attitude. She is always whining or complaining about something. Nothing is ever quite right and they are never completely happy about anything. If you say that it’s a nice day, they’ll reply that it’s probably going to rain tomorrow. This is completely childish. That’s true, Mike. Complaning about work or company related matters is prevalent at my workplace too. I guess that is a common thread in all workplaces. It is awesome that you and your co-workers have such close bonds. I can definitely see how that make the working experience so much more pleasant. The mutual respect also goes up tremendously when you’re friends outside of work too. i hope you can read and review the book by walter isaacson , steve jobs biography . I think my old place of business should read this book. great review.